Spider plants are wonderful houseplants for any home. As well as bringing beauty to a room, spider plants are always quietly working to improve indoor air quality. Chlorophytum comosum, commonly known as the spider plant, is also known to some as the ribbon plant, a nod to its graceful, ribbon-like leaves. Variegated cultivars of C. comosum are more popular than the green-leaved variety: ‘Variegatum’ is green at the center and creamy white at the margins; ‘Vittatum’ has green leaves with a broad white band down the center; ‘Picturatum’ sports a yellow central band. The spider plant is an attractive, easy-care houseplant which also happens to have the ability to improve the air around it. No need for synthetic air fresheners when a spider plant is on the job. According to Houseplants: The Green Thumb Guide to Easy Indoor Gardening, a 1989 NASA study revealed that several species of houseplants are capable of removing harmful chemicals from the air. The spider plant was one of the top performers. Other research has shown that a single spider plant is able to remove as much as 98% of the carbon monoxide in the air of a small room. 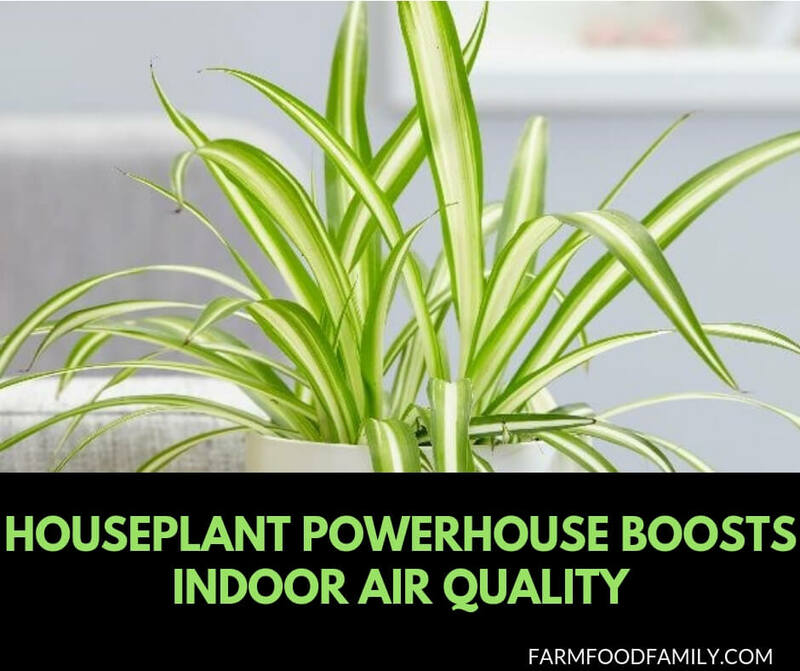 The spider plant is also a top performer in releasing high levels of oxygen into the air, as well as increasing the general level of humidity in a home. Higher levels of inside humidity mean lower levels of dust and airborne allergens, bringing greater relief from sore eyes and scratchy throats. A mature spider plant produces baby plants at the ends of its long stems. The spider plant babies or “plantlets” are normally produced in the autumn when daylight hours begin to decrease. The plantlets can be detached from the mother plant if there are well-developed roots, then planted individually in small pots with good soil and drainage material. If there are no roots, place a prepared pot next to the mother and gently bend the plantlet’s stem until it is resting on the soil. Pin the plantlet’s stem in place with a bent piece of wire (a paperclip bent into a long “u” works well) and pat the soil around the stem. When the plantlet begins growing new leaves, it may be carefully cut from the mother stem with a sharp knife. A healthy spider plant can provide an almost endless supply of beautiful plants for gift giving. A spider plant adds a lovely and interesting touch of color to a room, doesn’t demand a lot of attention, and improves indoor air quality by absorbing toxins and giving off oxygen. It might just be the perfect houseplant for any plant lover.